Match-winner Harry Cornick was overjoyed to get the only goal of the game at Bury on Sunday to send Luton through to the third round of the FA Cup. With just three minutes to go until half time, Cornick escaped his markers to tap in an excellent low cross from James Collins for his fifth goal of the season and third in six games. It’s a massive result for us to get into the next round and get the job done. He said: “It wasn’t a hard one, Collo’s done well to put it across the face, I’ve just got to tap it in. “I probably could have had another one, but I’ll take the one today. Cornick should definitely have had another one, or at the very least found team-mate Elliot Lee for an open goal just moments later, only to shoot waywardly over the bar when clean through. He continued: “I think it should have been 2-0, I should have squared it to Elliot, he might not speak to me for a few days. “I can’t repeat what he said, he wasn’t happy at the time, but happy we got the win as well. “So it was good to get another goal and good to get through to the next round. 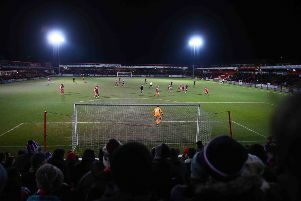 Defender Jack Stacey, who was up in the penalty area at the time as Lee, added: “I was actually behind Elliot, so we both had a word with him at half time. “But if he puts it in the back of the net, then we couldn’t have said anything. The Hatter didn’t have it all their own way though at Gigg Lane, as hosts Bury had the better of the early exchanges, with both Nicky Mayard and Neil Danns missing excellent chances. Cornick knew it was always going to be a difficult afternoon in prospect though, adding: “It was a tough game, they’ve obviously been doing well in League Two, and we saw that last year when we were there, it’s not an easy league to get out of. “They play well, they get the ball down and play out for the back which is unusual for a League Two team as that’s what we tried to do last year. “They popped it around the back and got us pressing, so luckily we got the goal and defended really well. “We had two or three chances towards the end and could have gone out of sight, but we dug in well.